One of the sight gags planned in the World Without Photoshop video was to make MacBook Pro’s look like shiny aluminum “CopyBook” scanners. 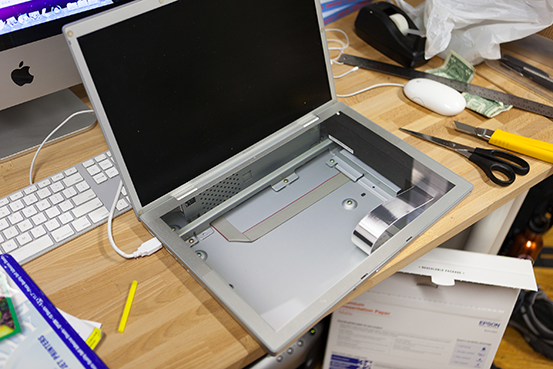 We needed to replace the keyboard and trackpad with the guts of a flatbed scanner. The image you see above is straight off the camera. The illusion of a scanner bed is just a printed piece of paper sitting over the keyboard. No Photoshop was used in the making of that photograph, however a quick Photoshop trick was used in the making of the image in the photo. The obvious irony being that, like most of the props required to create video, we then needed to use Photoshop’s image distortion powers to pull it off. Photoshop is a a registered trademark of Adobe Systems Incorporated.